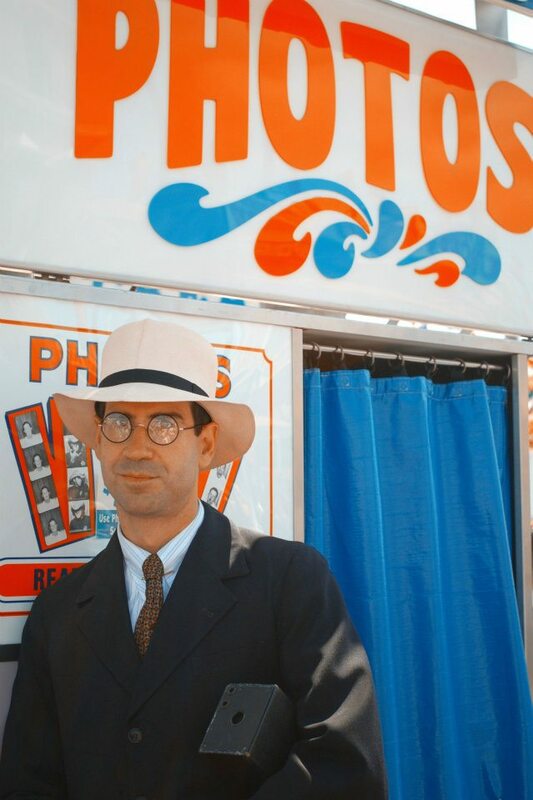 Yesterday we had a small meet up with some of our friends at the San Diego County Fair. 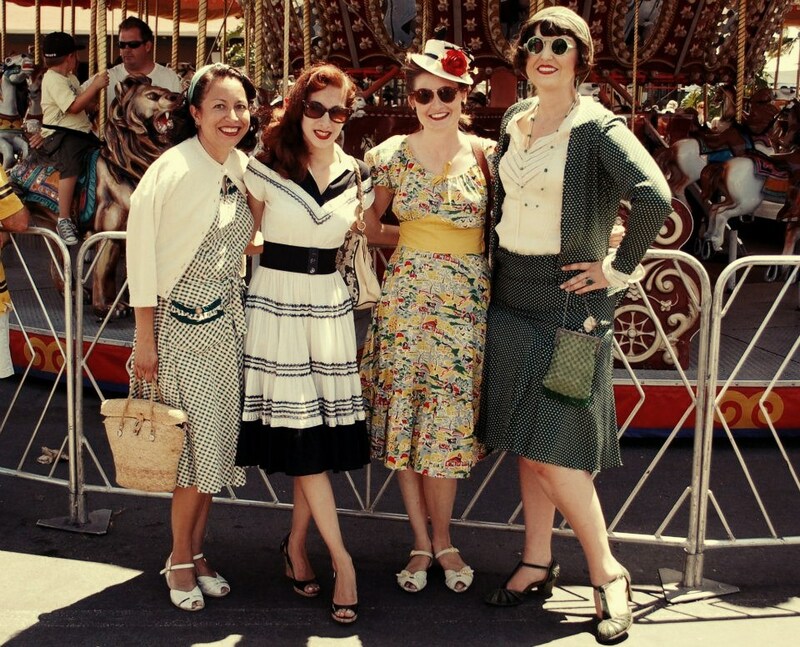 It was a beautiful day- clear skies, lovely weather, fun with friends, and old timey fair fun! We went to see the Horseless Rodeo, a nearly 100 year old relay of old time car races put on by members of the Horseless Carriage and Model T club. Unfortunately my husband and I were running super late and got there just in time to see the cars leave the arena. Oops! But we still had a blast wandering around the fair. 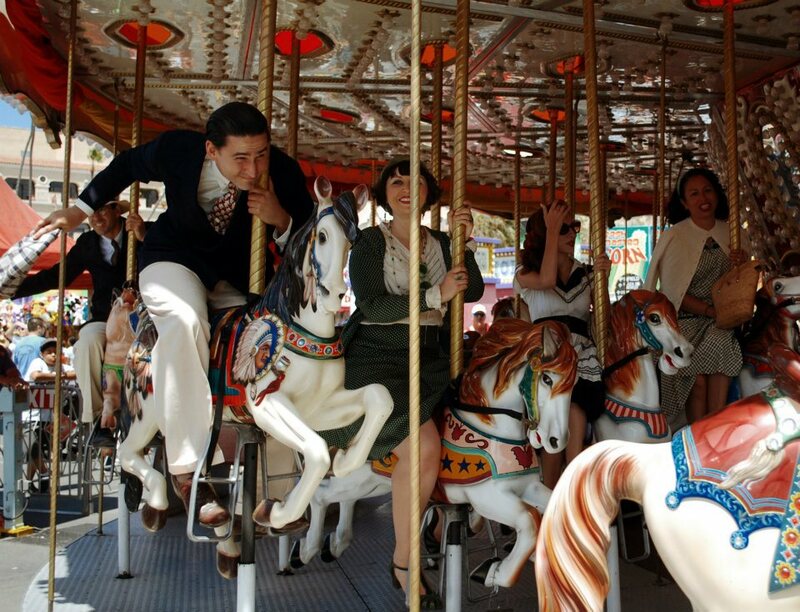 A crowd of five vintage jockeys relaying for position on the carousel. 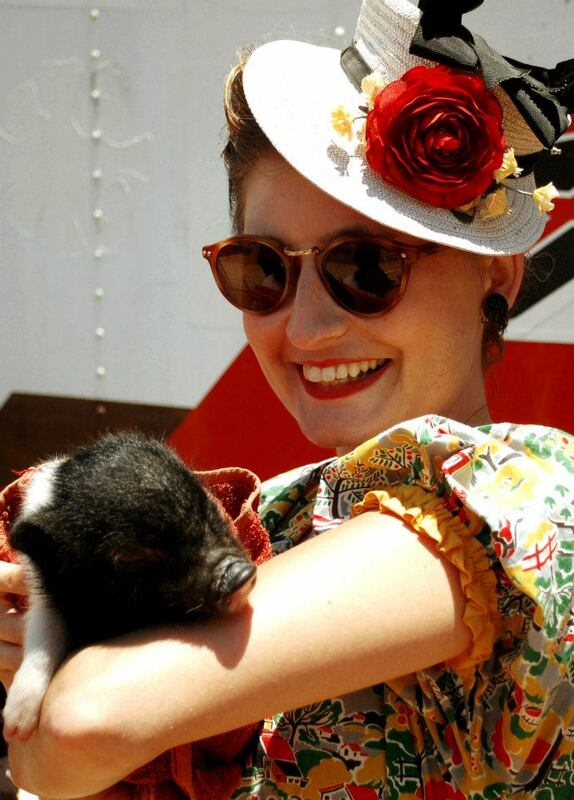 We couldn’t help standing in line to hold this adorable little piglet at the Swifty Swine Pig Races. 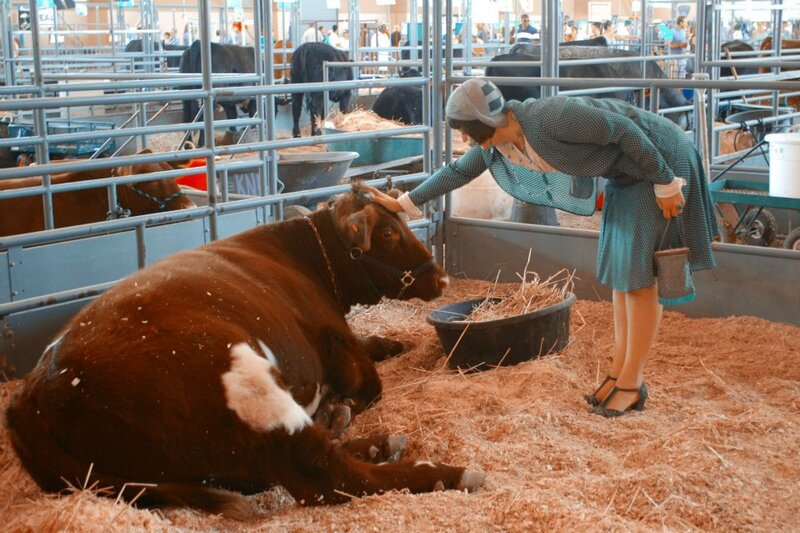 Katherine the Fearless makes friends with the bovine. She’s a very talented artist who has just started a sketch blog on Tumblr. 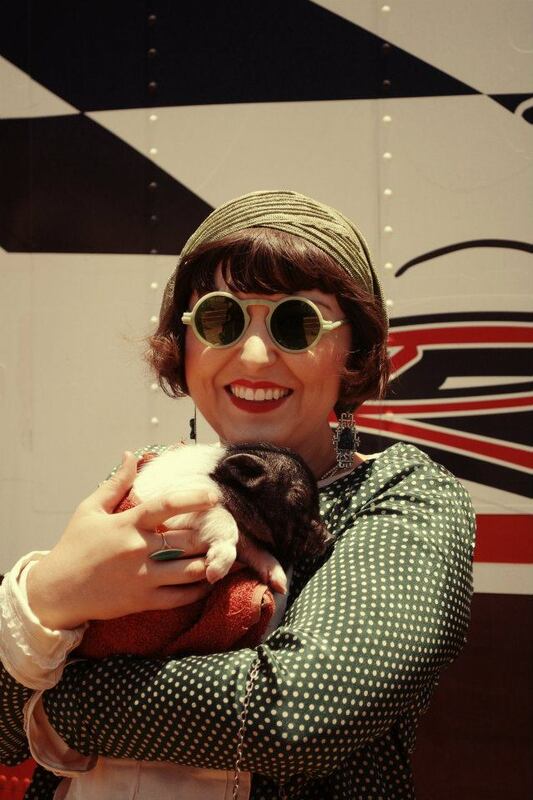 My vintage dress was a gift from talented makeup artist friend Kat of GoForKat Makeup Artistry. A close up of the fabric print. How could I resist wearing it to the fair? And the photobooth picture! You can just catch a glimpse of my husband’s glasses (and nose) in the upper corner! Hehe! What a fantastically fun day! Now that’s a bunch of well dressed folks if I ever saw one :) You look like you had a great time. You all look wonderful, and it looks like you had fun, too! How cute! I looove the white dress with black trim – if you changed the black trim to navy, it could pass for a sailor’s dress! I was sorry I couldn’t make it down for the day. What fun you all had…and everyone was so well dressed (as ever). LOVE that dress Kat gave you!!!!! Oh my, you have the best-dressed group of friends!! How marvelous to see such a good looking crowd! 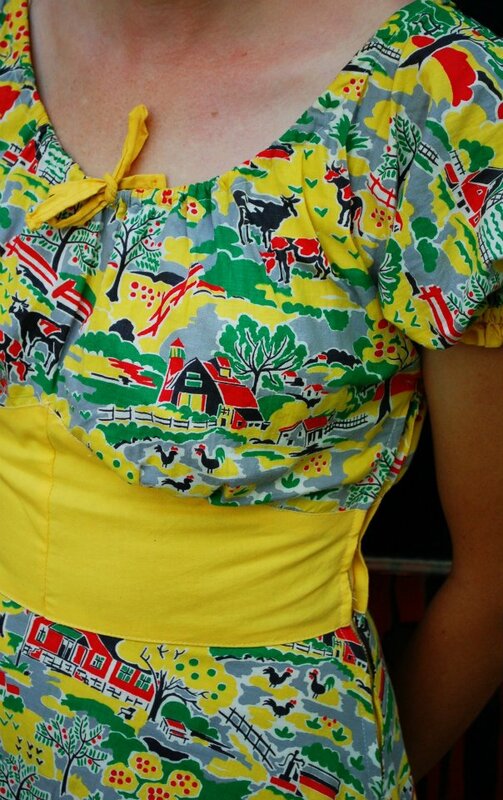 And that farm-scenes frock is one of the most fantastic prints I have ever seen; it reminds me of vintage wallpaper. What a happy bunch. 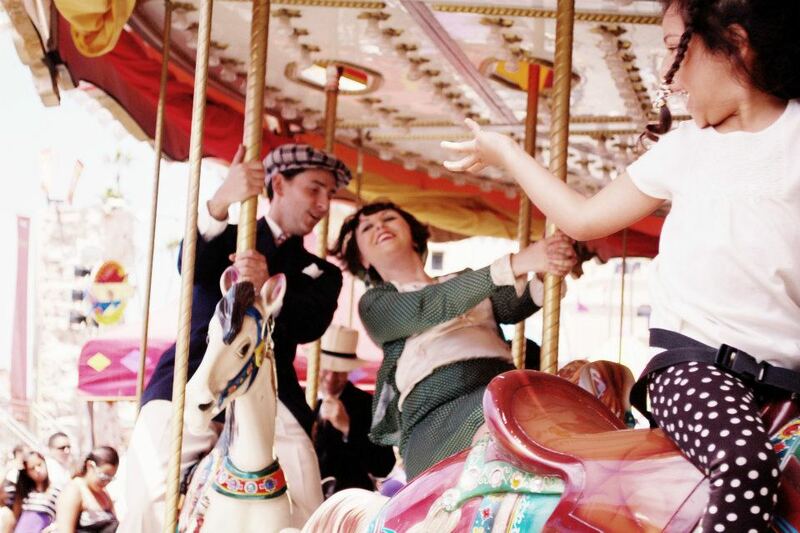 I love those carousel pictures! 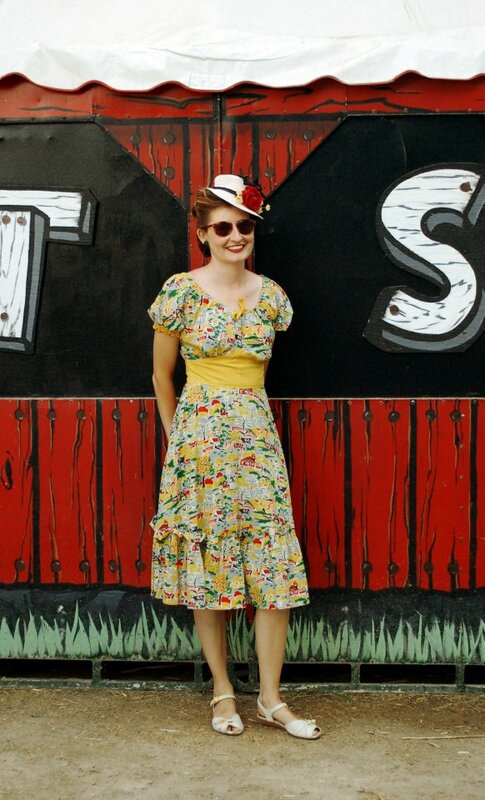 The farm fabric print is ultra-adorable as a dress! How neat!!! 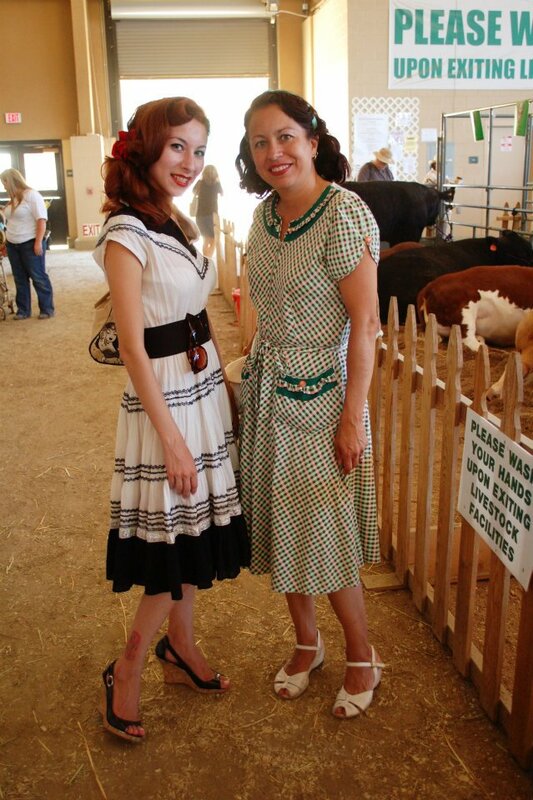 That dress really is perfect for a fair! Oh, if you like those photobooth style photos go check out photofunia and you can make some yourself. I love it! So sad to see I missed this! I never think of going to this fair. Thanks for the reminder. Too late for this year, but I’ll have it on my radar for next. You all look so fantastically wonderful! Love your vibrantly hued dress, it’s oodles and oodles of summery fun!